Thirty percent of Tennessee’s population lives in a high poverty area. Tennessee has the sixth-lowest income in the country. 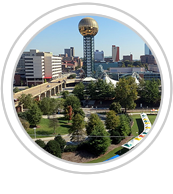 Description: Knoxville is a city in the U.S. state of Tennessee, the county seat of Knox County, and is situated in the Great Appalachian Valley (known locally as the Tennessee Valley).